The Allison 6620 fully automatic transmission, which was just unveiled at 2010Bauma, will be put into use in the second half of 2010. The new 6620 transmission has been greatly improved on the basis of the original Allison 6000 series transmission, and new transmission applications The most advanced hardware and software are applied to dump trucks under 70 tons, fixed equipment pumps, drills, and winch machines. The new models improve vehicle durability, further reduce operating costs, and simplify the maintenance process. The new 6620 gearbox replaces the 6610 in the market and is designed to adapt to the increasing trend of the increasingly common characteristics of the new engines on the market. The application of engine numerical control technology makes the torque response in the 6620 transmission power transmission system more sensitive, thus enabling power. The drive system is protected. â€œWe have made improvements throughout the entire product to further extend inspection intervals and increase durability,â€ said Brian Rosse, non-road products manager at Allison. â€œThis includes a complete upgrade of design, manufacturing technology and materials.â€ In the case of a flywheel, due to the use of FEA, the radius of the fillet is improved, heat treatment is introduced, stress is reduced, shaft diameter is increased, and surface hardening and nitriding of other interface elements such as turboshafts and bushings are performed. , enhance fatigue durability more than six times. Through a large number of field comparison experiments, the 6620 transmission finally determined a more durable locking element based on bronze. On the software side, the Allison 6620 automatic transmission has also undergone critical software upgrades for its wide range of applications in mining, quarrying, and construction. The 6620 uses a new CEC3 electronic control system, including an expanded CAN communication system (J1939 protocol), as well as other software interface upgrades. This will bring more convenience to vehicle manufacturers and end users. Through these changes, vehicle manufacturers can benefit from more simple and more advanced vehicle integration applications; for example, choosing more suitable replacements. 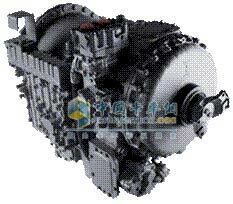 The gears can realize the operation of two kinds of working conditions, which can make the gearbox can easily choose the dynamic or economy according to the requirements of driving conditions. â€œIn the face of the globally challenging economic environment, vehicle manufacturers' engineers can easily optimize the operation of the vehicle according to operating conditions,â€ Rose said. â€œAllison's consistent product Improvements in technology are designed to work with vehicle manufacturers to achieve the best combination of vehicle operating costs and operating efficiency." In more than sixty years of market testing, Allison's superior performance and reliability have made it well known in the heavy dump Truck industry. At present, there are many global automobile manufacturers with prominent reputation in the industry that use Allison transmissions. These vehicle manufacturers include Adlas, Sany, Terex, Perlini, and Aspen. Tel, Hitachi trucks, and so on. The 6000 series is now widely used in oilfield armored pumps, drilling rigs and other stationary equipment and incorporates CAN-based control software systems, which make remote pumping and drilling operations possible, such as Halliburton and Schlumberger. "Now, through wired control and diagnostic feedback control, Allison enables users to more easily operate and more accurately monitor the real-time performance of the transmission." Rose said.